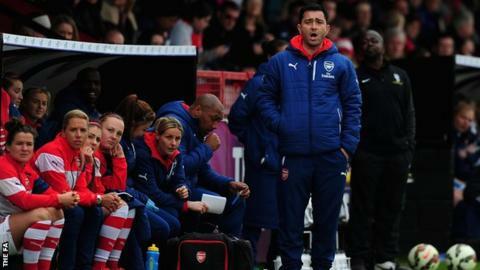 Arsenal Ladies boss Pedro Martinez Losa wants to give his younger players an opportunity to impress in this season's Continental Tyres Cup. Arsenal are the most successful side in the competition's four-year history, winning the tournament three times. Losa's side, who were beaten by Manchester City in last year's final, start their 2015 campaign against WSL 2 club Watford at home on Thursday. "We want to be in the final. We want to win," Losa told BBC Sport. "But our philosophy is to go game by game. We have a game against Watford on Thursday, then we have a game against Notts County. "We want to beat Watford and we will give opportunities to young players. We are very proud of them and they are at the level to play."